Home Cleaning Tips & Tricks! There are many different types of stains that can happen in a household, and some types of stains happen more often than others. 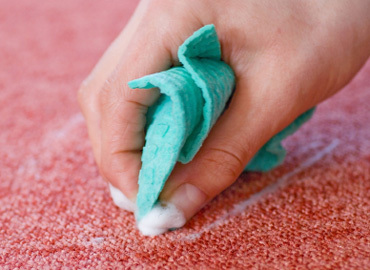 Here are some tips and tricks to clean common spots and stains that occur in households. When using these tips as guidelines, the results will vary depending on the type and severity of the stain. This is in no way a definitive stain/spot cleaning guide, but just a guideline to help get rid of some stains that commonly occur. Print these tips out and post them on your refrigerator for easy access. This is only applicable if the burn isn’t severe. First, rub the burn with dry steel wool. If you feel you are up to it, try and cut away the damaged, burned clusters. This should make the damaged area look better, but this should only be done with cigarette burns or any burns that are small. When the burn is severe, find a hidden area to scrape fibers from, and find a powerful adhesive to patch the fibers to the burned area. Use a dry cleaning solvent to put on the dirtied area. Start from the outside and work inward to avoid spreading the oil spot. After you’ve done this, apply a light detergent solution, then rinse it with cold water and blot until dry. Remember not to rub the stain in or it will be harder to get out. Use a detergent solution, and then blot the area with it. Rinse the area with cold water, and blot again to dry. Use ammonia solution on the area, and blot that solution out. After that, use a vinegar solution and then blot, and rinse once more. This will take out the grass stain fairly well, depending on how big the stain is. Try and blot out all the liquid you can by placing a clean towel directly over the area and applying weight on it. You may even want to leave the dry towel over it with something heavy and flat (like a dictionary) sitting on top for several minutes. Spray on a bacteria/enzyme digester, and follow the directions for the particular brand, then leave it to dry. When it’s dry, remove any part of the stain remaining with detergent solution, then rinse, and blot once more until it is dry. Before doing anything else, try and scrape up as much of the vomit as you possibly can to make the rest of the job a little bit easier. After that, apply a bacteria/enzyme digester and use it according to its particular directions, and then wait for it to dry. When the area is dry, remove any remaining stain in the area with a detergent solution, and then rinse it with cold water. Finally, blot the area until it is dry. Use a dry-brush to remove as much of the mildew as you possibly can without ruining the carpet. Grab a disinfectant solution, and sponge the area, and then blot the area. After, sponge the area with some ammonia and rinse. When the area is dry, you can bleach the area with hydrogen peroxide.